I met Juliet Roger when my husband and I bought her house. Little did I know that from this real estate transaction I would gain not only a great home, but a collection of beautiful jewelry and a lovely friend. Although I think the title, "jewelry designer" gets tossed around just a bit too often, Juliet is the real deal. Her designs have many personalities--simple and elegant, edgy and fun, totally on trend and ahead of it as well. 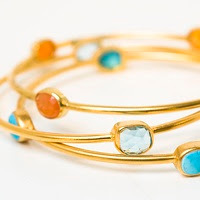 Using precious and semi-precious gems--this is one bling I cannot seem to get enough of! I get the most compliments on it of any jewelry I wear and I have given her pieces as gifts countless times. Its a birthday tradition between my girlfriends! Her jewelry has been featured in InStyle, Seattle Bride, Lucky, Real Simple and other mags that are in the know. It is also sold at Via C at Nordstrom and several boutiques around Seattle, but a trip to her Seattle studio is one of my favorite stops. And you know what they say about jewelry and handbags.....they always fit. Stop by Juliet's studio from 12 to 5 pm on Friday, April 16, 2010, to celebrate her 10 year anniversary, check out her new spring line, get in on some special prices on pieces normally never on sale (they don't really need to be--they are so cool they fly out the door). Details: Juliet's Studio, 150 Prospect Street, Seattle, 98109, 206-282-3300. Happy shopping girls.